This Temple, dedicated to one of the most Eastern saints St. Basil the Great, was built in the late 18th century. The literature refers the period of its construction also in the first half of the 18th century, respectively year 1750. It has a three spaces log structure with two towers. Its special feature is the over-meter difference between the narthex and the sanctuary. In the main tower are three bells, two of them from 1796. In the temple is still an interesting counterpoise mechanism for a chandelier preserved and also a ladder made of one piece of wood. The iconostasis from the 18th century has four rows architecture. Its rarity is that the royal doors are adorned by Jesse tree with ten medallions of Christ’s genealogy, instead of the usual four Evangelists and the Annunciation. In frame of the project “Restoration of wooden churches, improvement of infrastructure of the Icon Cycloroute” were realized the following works: complete renovation of shingle roof, cleaning and new coat of the interior walls and floor, renovation of wooden coat, restoration and repair of entrance door, new electrical installation and instalation of signalisation device. 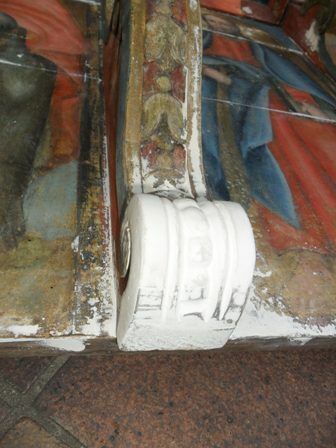 The restoration of historic iconostasis, altar, 2 crosses and wooden box were realised too. In the church is installed the exposition “Icons of Zemplin” focused on icons of Halics-Carpathian type from the 17th and 18th century. 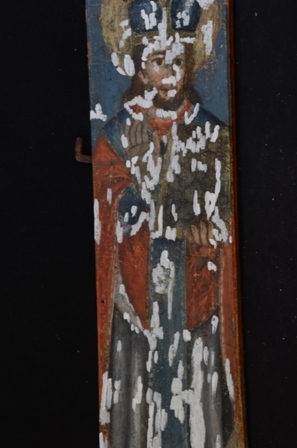 It presents the interesting discoveries in the iconography of wooden churches of the Icon Cycloroute Nová Sedlica – Inovce found thanks to the hard work of restaurators.